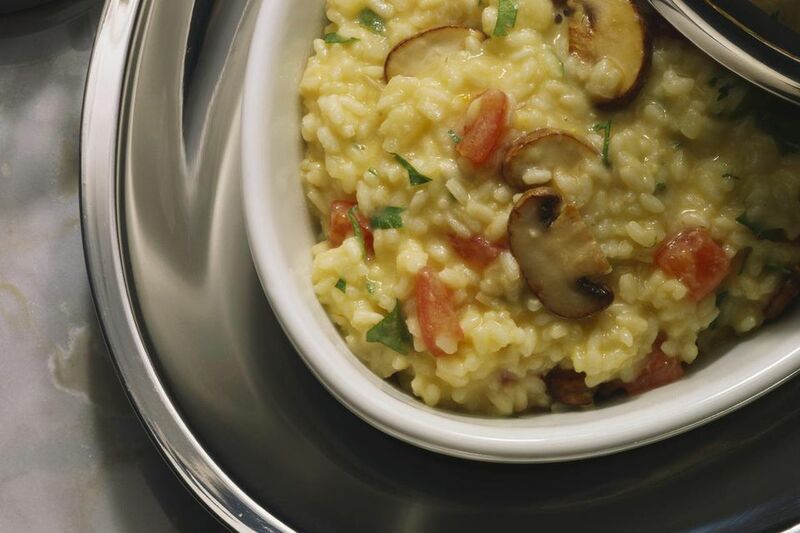 Scented with a shiitake mushroom broth, woodsy thyme, and dry white wine, this recipe for creamy-yet-dairy-free vegan mushroom risotto is refined comfort food, not to mention significantly healthier than butter-and-cheese-laden varieties. The key to a perfect vegan risotto is all in the wrist because constant stirring is a must. Feel free to add other vegetables such as broccoli or leeks to this recipe. It's incredibly versatile and easy to dress up with a variety of herbs and spices and dairy-free to boot. In a small heatproof bowl, combine the shiitake mushrooms with the boiling water and let them soak, uncovered for 30 minutes. Drain the liquid into a medium-sized saucepan and use the mushrooms for another purpose. Add the vegetable broth to the saucepan, bring the mixture to a boil, reduce the heat to a simmer, and cover. In a small bowl, toss together the lemon juice, spinach, and salt. Set aside. In a separate heavy-bottomed saucepan over medium heat, warm 1 tablespoon of the olive oil. Add the chopped garlic and onions and cook, stirring occasionally, until the onions are tender and translucent, about 6 to 8 minutes. Add the crimini mushrooms and thyme and cook until the mushrooms are soft, about 4 minutes more. Add the remaining 1 tablespoon of olive oil and the rice and, stirring constantly, cook until the rice is evenly coated and making snapping and popping noises, about 4 minutes. Add the wine, stirring constantly, until all of the liquid is completely absorbed. Ladle 3/4 cup of the simmering broth into the rice and cook, continuing to stir, until most of the liquid is absorbed. Continue to add the broth in 3/4-cup increments, allowing the liquid to be absorbed before another addition until the rice is translucent around the edges but still solid in the middle and the rice is of a creamy consistency, about 20 minutes. Add the reserved spinach-lemon juice mixture and cook for just about 2 to 3 minutes, stirring constantly, or until the spinach is wilted and bright green. Stir in the dairy-free soy margarine and nutritional yeast. Add salt and pepper to taste and serve immediately.